40% Off with Deal of the Week at Canvas Holidays - Don't Miss! 40% Off (or More) Bookings with Daily Deals at Expedia.ie - 24 Hours Only! Canvas Holidays has been taking its clients to the very best campsites in Europe for over 50 years. Key to its appeal is its range of accommodation and you can choose from highly glamorous lodges to the standard tents on offer, meaning there’s always something that’ll fit your budget. Its Selection strand is great for an all-encompassing service, whilst the Life campsites are ideal for more independent minded travellers. You can even search its range for golf holidays, family-friendly locations, dog-friendly campsites, couples holidays and much more. Its Zero2Five programme ensures little ones have plenty to keep them occupied, whilst the FamilyExtra programme will cater for older kids too. Check out its Special Offers page that has deals running during half term and holidays, as well as its blog with loads of destination ideas to make sure you’re always inspired and in the know about what's on offer. Often award-nominated and rarely bettered, Canvas Holidays brings the best of Europe to you and your family! How do I use my Canvas Holidays promotional code? 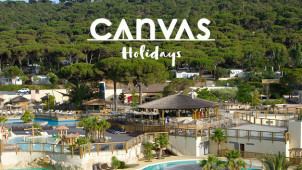 Check out Canvas Holidays’ special offers for some great deals! Do I pay a deposit with Canvas Holidays? Only if you’re booking more than 12 weeks in advance. Booking within this time means you’ll have to pay in full up front. What is the Canvas Holidays Breakage Waiver? This is an optional waiver to protect you against accidental damage and loss of equipment occurring in or to your canvas accomodation. It cost €20, more details here. Is my Canvas Holidays booking ABTA protected? This means if Canvas Holidays fails in advance of your holiday you will get a refund. If it fails during your holiday you will be reimbursed for any extra costs you incur. There’s nothing like a good camping holiday for experiencing beautiful surroundings and creating great memories, so book a tent or mobile home with the best at Canvas Holidays. Shop with a Canvas Holidays discount code from vouchercloud to get amazing quality at a saving — with a range of full service campsites featuring unrivalled amenities, it’s sure to become your go-to for sorting your excursions in the great outdoors. Experience the best of Europe with canvas today! Canvas Holidays features over 200 campsites across the continent, giving you unbeatable choice in where you spend your holiday. You’ll find seaside accommodation in Italy’s Emilia-Romagna, rural splendour in its French countryside retreats and mountainside camping in the Alps. Every site contains high quality facilities to ensure your comfort and is well placed to explore the local region, so whether you want to see the country or just hang out in site you’ll be sure of things to do.